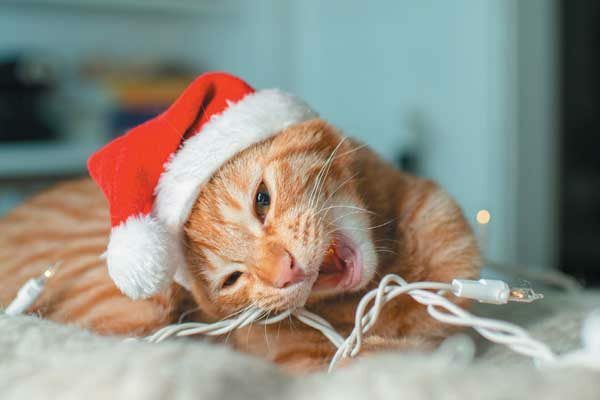 The holidays are a fun time of year but can be dangerous for your kitty. Keep these seven not-so-jolly tree dangers away from your cat this holiday. Christmas is a magical time of year, but it isn’t always the best holiday for cats. There are lots of dangers, from tinsel and ribbon to poisonous seasonal plants like poinsettias. And, for many homes, Christmas trees are the centerpiece of the season, but they too can be a lot of trouble for cats. 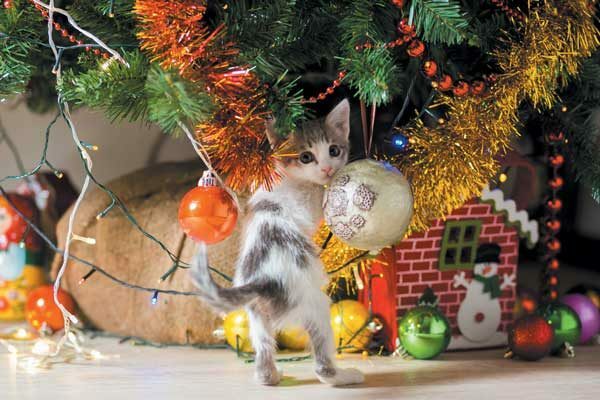 Here are the top dangers for your cat if you decide to put up a Christmas tree. If you have a real Christmas tree, one of the most important things you can do this holiday season is to keep your cats away from the water at the base of the tree. Increasingly, companies are marketing various chemical enhancements that can keep your trees alive longer but are toxic to your cats. Beyond added chemicals, it turns out all Christmas tree water is dangerous. Jordan explains that the water from Christmas trees is toxic to cats because of fire retardants that are sprayed onto most Christmas trees before they are sold, plus pine sap is toxic to kitties. 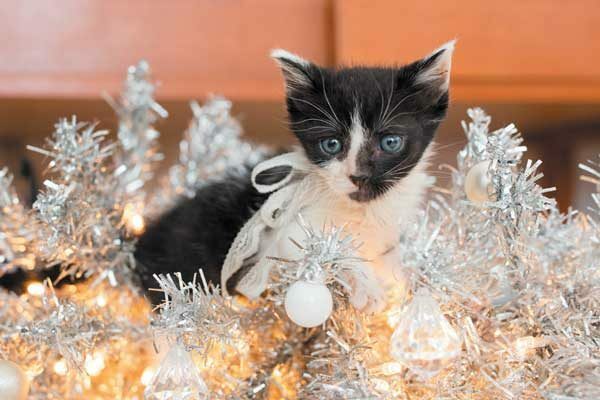 Christmas lights might look beautiful on the tree, but they can be extremely dangerous to cats. “Christmas lights may cause a thermal burn if a cat chews on the wires. In addition, cats can be injured by sharp edges from broken lights,” cautions Dr. Lori Bierbrier, the medical director of NYC’s Community Medicine. Christmas tree ornaments made of wood, fabric and sturdy plastic are safest, as they are least likely to break if they fall. Always avoid glass and other easily breakable ornaments as well as tinsel. However, even ornaments too large for your cat to accidentally eat can be dangerous. Snow globe-type tree ornaments and decorations often contain antifreeze, which can be very dangerous if they crack and cats get access to the liquids inside. Cats climbing Christmas trees might make for a cute picture, but it can also be very dangerous, as trees can easily fall over, breaking ornaments or injuring your cat. If your cat is prone to climbing and you want to have a full-sized Christmas tree, a great option is to anchor your tree to the wall and ceiling to ensure it can’t tip over and injure your cat. “An artificial tree is the safest tree option for cats. They can still get in trouble by climbing the tree, and you’ll still need to be careful about how you decorate it, but when in doubt, it’s best to go with an artificial tree to avoid the more serious health risks associated with a real tree,” Jordan advises. However, you still need to monitor your cat around the artificial tree. 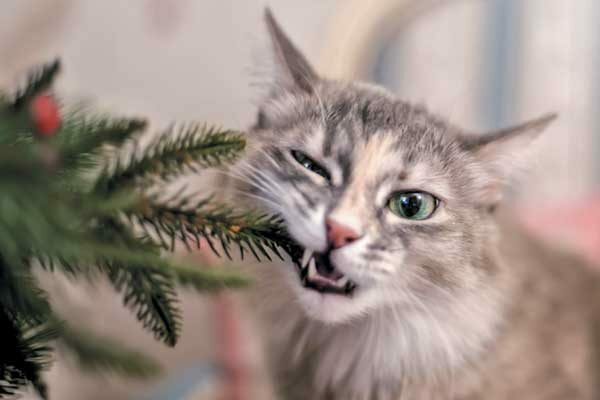 “Cats should not chew on an artificial tree, as they may accidentally ingest pieces of the tree which can cause both irritation and potential blockage.” Dr. Bierbrier advises. Make or buy a plywood Christmas tree cutout that can include painted-on ornaments. Forget the tree completely and hang Christmas tree ornaments from your ceiling where your cats won’t be able to reach them. Repurpose a small triangle-shaped shelf, paint it green (or not!) and fill it with special trinkets to remind you of the year or of the season. Create a tower of books (make sure they are stable) to put packages underneath. Make a cat-safe fake tree out of paper or wood and put your gifts by it. Thumbnail: Photography ©talltrevor| Getty Images. Sassafras Lowrey is an award-winning author whose novels have been honored by the American Library Association and the Lambda Literary Foundation. Sassafras is a Certified Trick Dog Instructor who shares her home and writing life with three dogs, two bossy senior cats and a formerly feral kitten. Learn more at sassafraslowrey.com.